The air was humid and the weather misty. 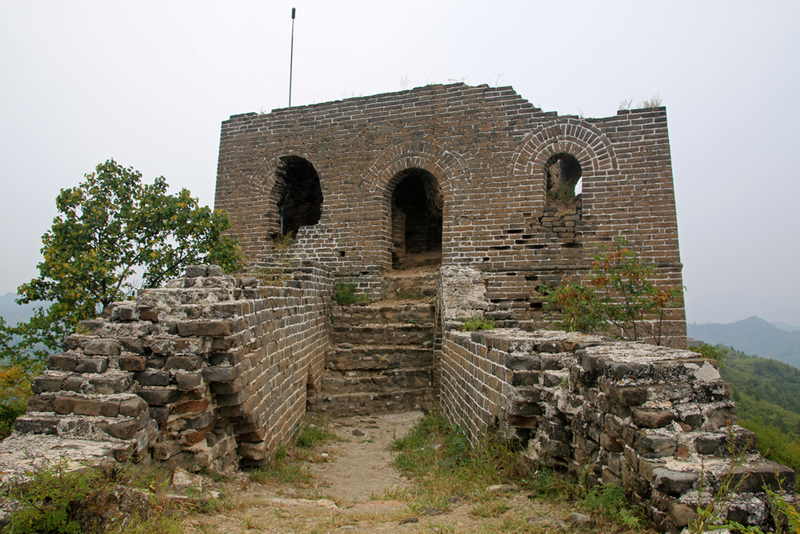 Although it was already end of August it was still hot when we ascended the unrestored wild Great Wall at Gubeikou. 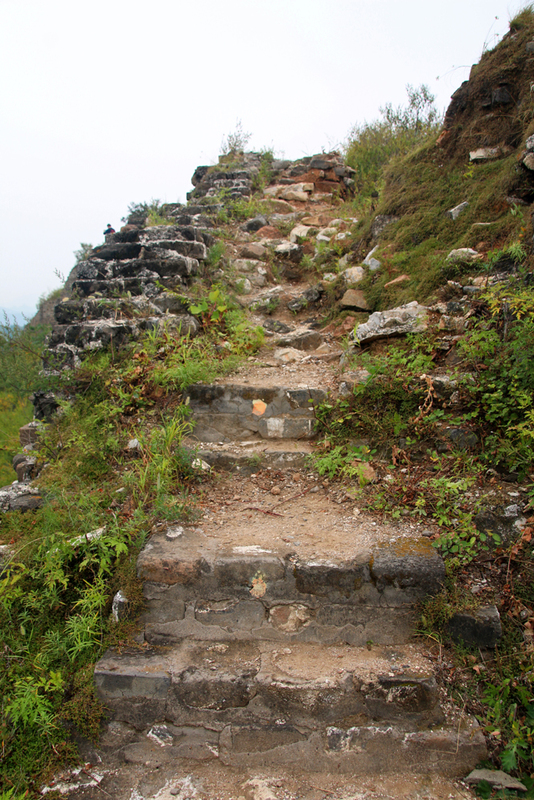 But when we reached the first viewpoint on our hike we knew that the climb was worth the effort. We could see several watchtowers stretching over lush green hills and the valley down below. I had been to another section of the Great Wall called Mutianyu twice in 2013, one of the best-preserved parts of the Great Wall, which offers a cable car, a toboggan plus several touristic facilities and that is said to be very family-friendly. 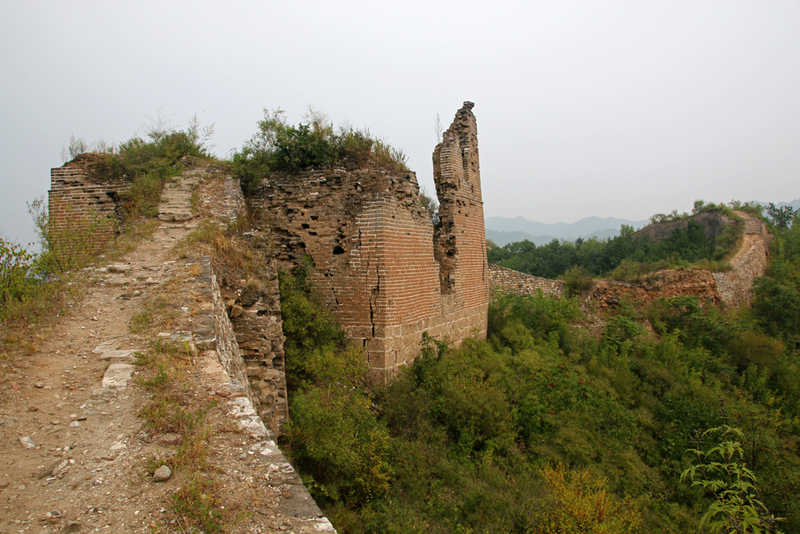 However, the Great Wall in Gubeikou is totally different. 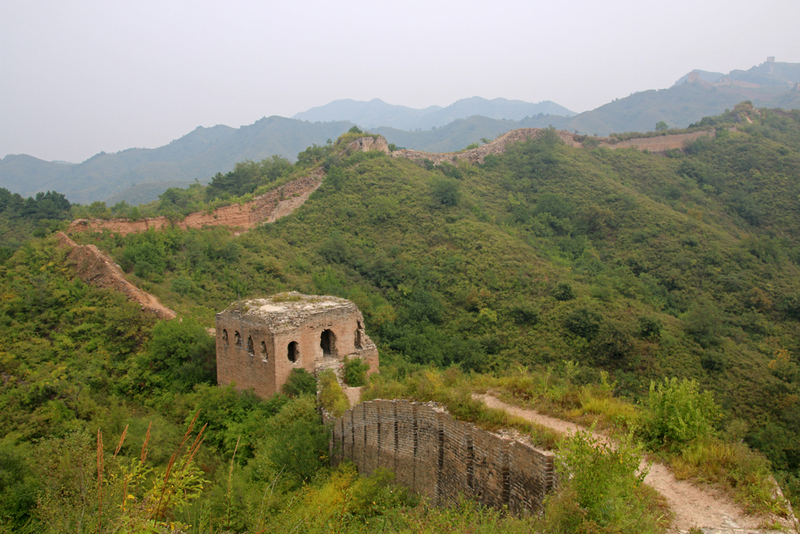 It is one of the most isolated segments of the wall in Eastern China with a fully restored eastern section and an unrestored wild western part. There are no toilets, no shops, no local vendors, no tourist facilities on the unrestored part, just the rough wild Gubeikou Great Wall. 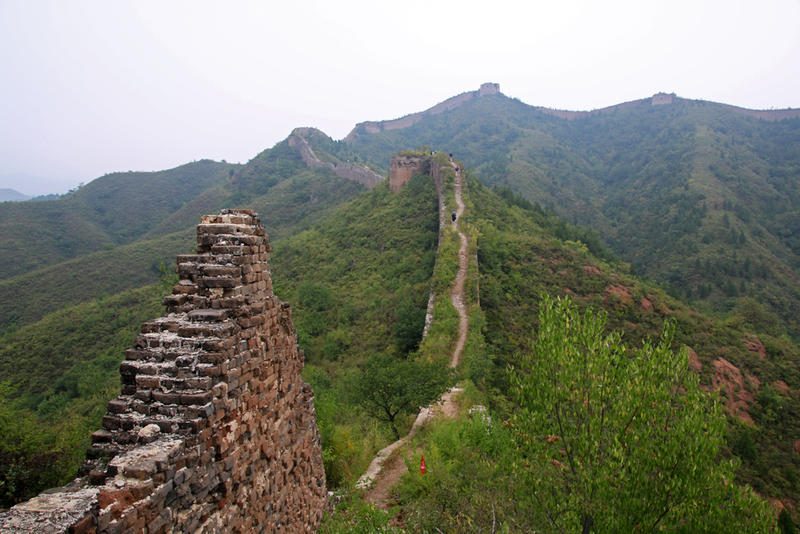 The Gubeikou Great Wall had a high strategic significance in former times because of its location near the mountain pass between Beijing and Chengde. 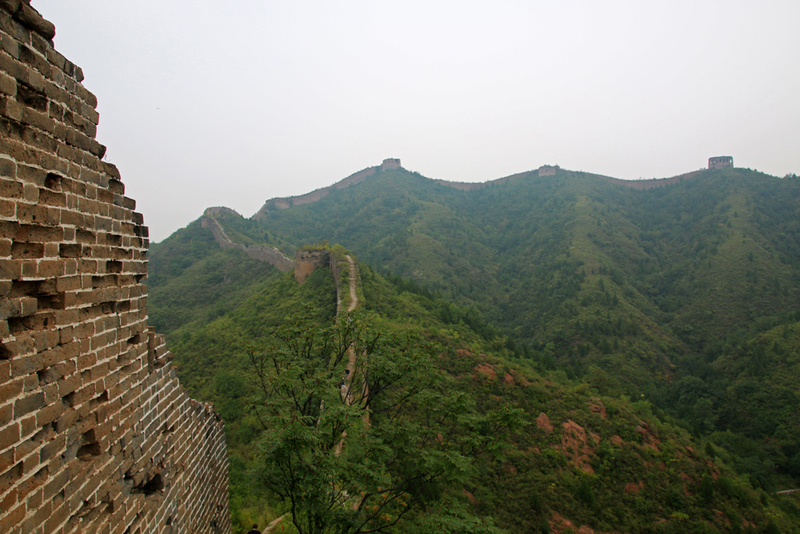 A wall was constructed near Gubeikou already between the fifth and the third century BC. In the sixth century AD the Northern Qi built a wall from Juyongguan via Gubeikou to Shanhaiguan, the now easternmost section of the wall. 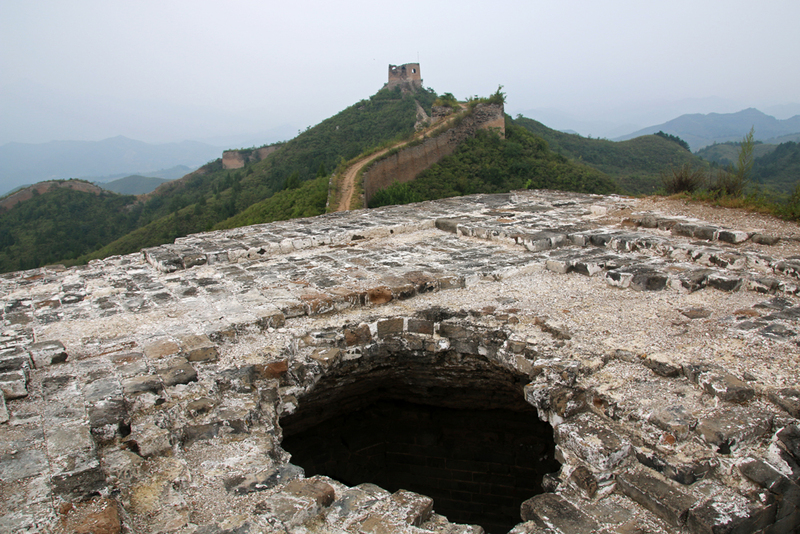 In the Jin Dynasty a fortress was built. The Han stationed troops there to protect China against the horse-mounted nomads from Central Asia. During the Ming Dynasty emperor Zhu Yuanzhang had a whole fortress city built including the fortresses of Juyongguan and Xifengkou and stationed his imperial guards there. 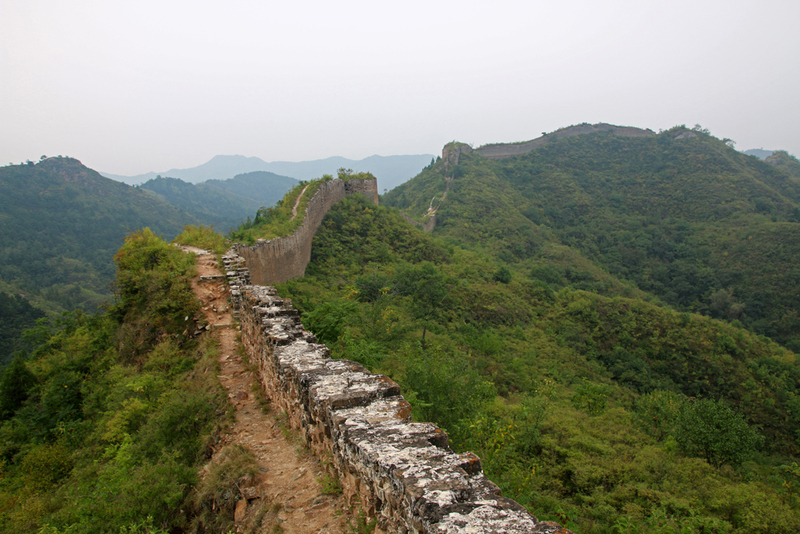 In the 16th century the Gubeikou Great Wall was strengthened and guarded by a strong troop. 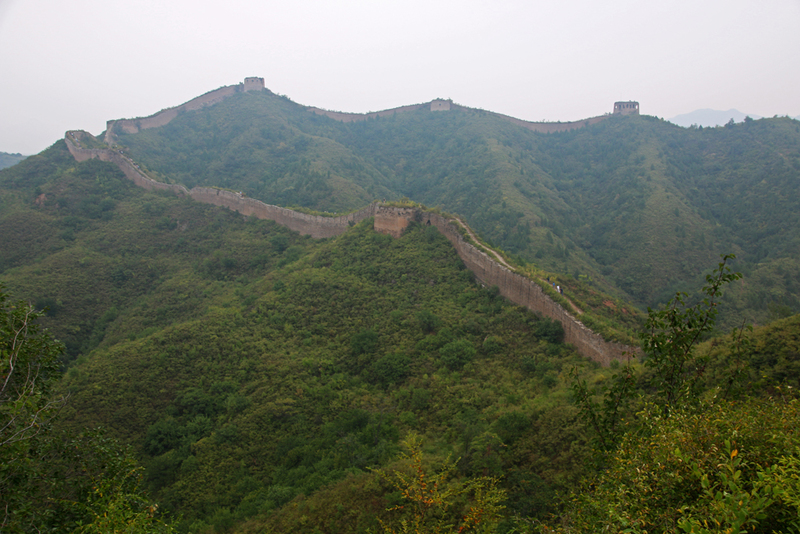 But it was not until the Qing Dynasty that the Gubeikou Great Wall lost its high strategic importance. 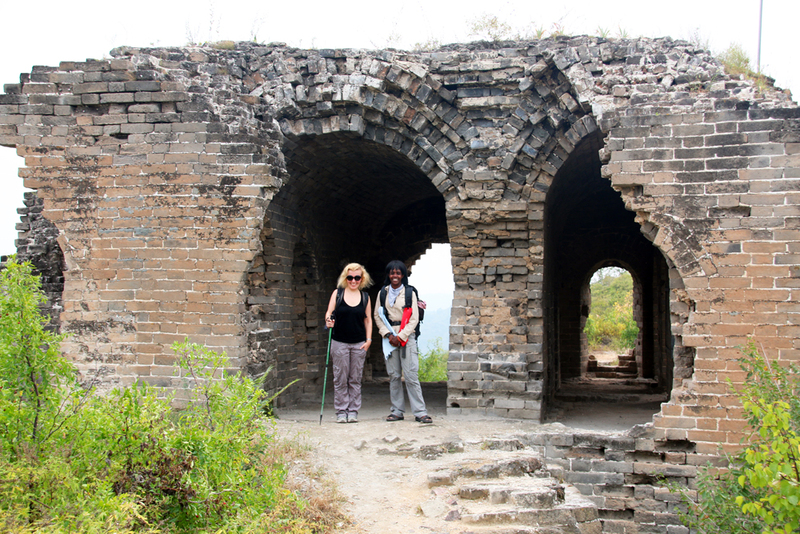 I hiked on the Gubeikou Great Wall together with my American friend Mill. We had met each other in July 2010 on my very first trip to the Middle Kingdom where she was my tour leader in Yunnan and Tibet. Ever since we had kept in touch and had met again in Beijing in October 2013 where she is still working as a hiking guide for a local hiking company in Beijing. Back then she had been jokedthat I would probably never join her on one of her hikes and that was a bet I had happily accepted. So as soon as I knew that I would return to Beijing in August 2014 we had talked about doing a hike together and she suggested that I’d join the Gubeikou hike because the Great Wall there is totally different than in Mutianyu and for the beauty of the landscape on this section. I did the hike together with other people who had booked the tour through Mill’s hiking company. Mill who led the hike had told us already on the bus about the specifics of this hike. There would be a colleague of her in front of the group who would mark the trail with little flags and Ken, another guide of the company, would be at end and collect the flags after everyone passed by. If we had to go to the toilet we would need to squat in the bushes but we should ensure to tell one of the guides about it to avoid getting lost or left behind. The hike was moderate. Mill and I were at the end of the group, together with Ken and an Australian diplomat. He had lived and worked at the Australian consulate in Shanghai for a few years and was now back in Australia where he worked for the foreign ministry in Canberra. He was in Beijing on a business trip together with three colleagues, all of them diplomats. They also attended the hike but the other three were further in front. Our group was generally wide spread and since we were the only ones who were hiking on this part of the wall it seemed as if we had the Great Wall for ourselves. For a while the trail led through a pine forest but most of the times we had an amazing view of the Gubeikou Great Wall which stretched over the mountain ridges. Most of the time we could hike on the wall itself but sometimes we had to walk next to it because the remains were to narrow. Partially the wall was well preserved other parts of the monument were in a crumbly condition. The same applied for the many watchtowers which we passed. While some of them were only ruins others were largely intact so that we could climb on the tops for amazing panoramic views of the terrain. One notable watchtower had a hole in the roof so that we had to be careful not to burst in when walking around but it was also impressive and definitely part of the adventure. Altogether we hiked eight kilometres which took us between three and four hours. Eventually our group met again and we were taken by bus to a nearby restaurant. After the hike we were all hungry, so that the late lunch was well-deserved. The restaurant provided a variety of several local dishes and didn’t stop serving until we were all very full. I sat together with the Australian diplomat and his colleagues who were all really nice. One of them had lived in Germany during his studies. He spoke very good German and was happy to practice the language. 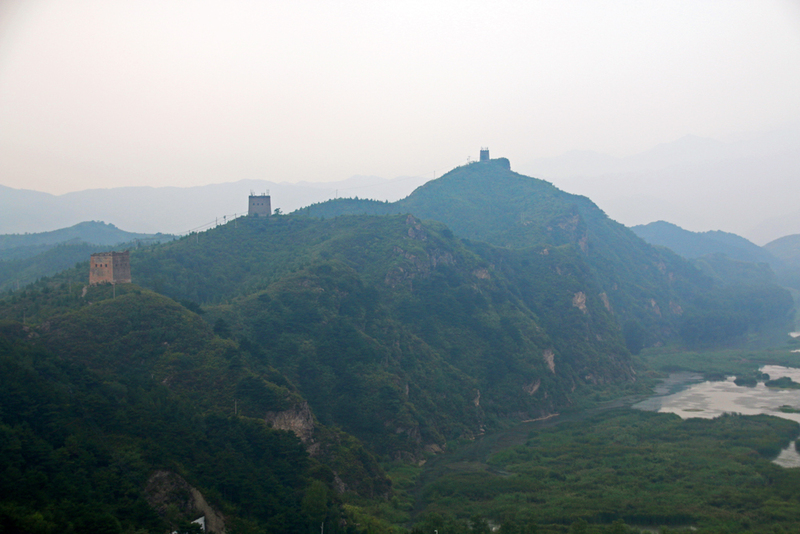 Gubeikou is not only a wild part of the Great Wall it is also further away from Beijing than Badaling and Mutianyu. 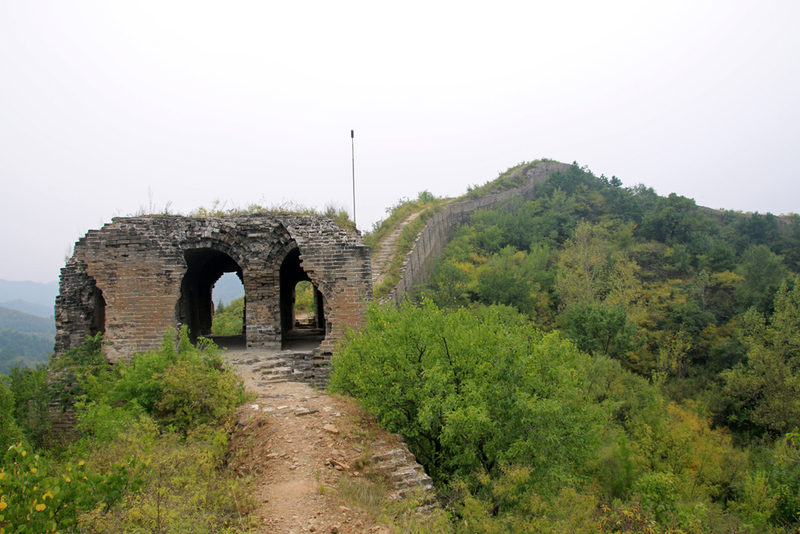 While the Mutianyu section is only 70 kilometres northeast of central Beijing, the Gubeikou Great Wall is located in Miyun County at the border to Hebei province, about 130 kilometres northeast of central Beijing. The drive there takes between two and two and a half hours but the hike and the scenery on the wild Gubeikou Great Wall are definitely worth the effort. If you are more interested in visiting a well-preserved section Gubeikou might not be the right part for you and you better head to Mutianyu or Jinshanling. 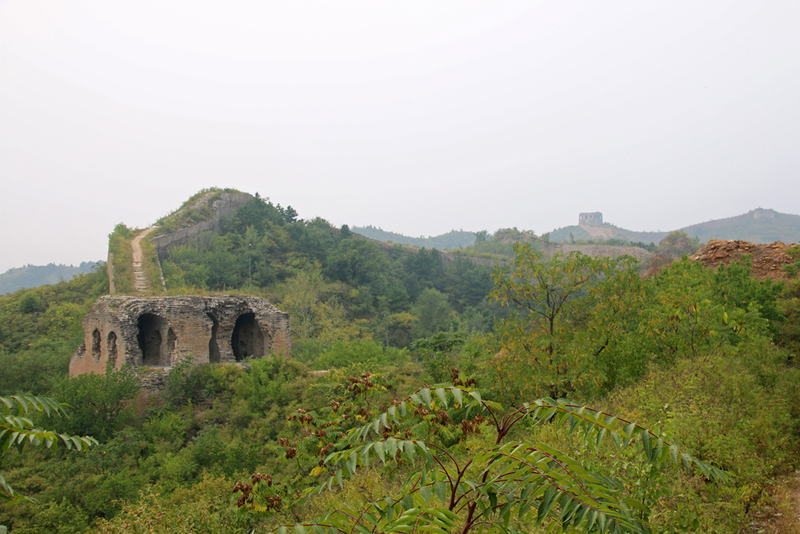 But if you like to explore a remote and pristine part of the Great Wall you should definitely consider visiting Gubeikou. Have you been to the Great Wall? Which section did you visit? 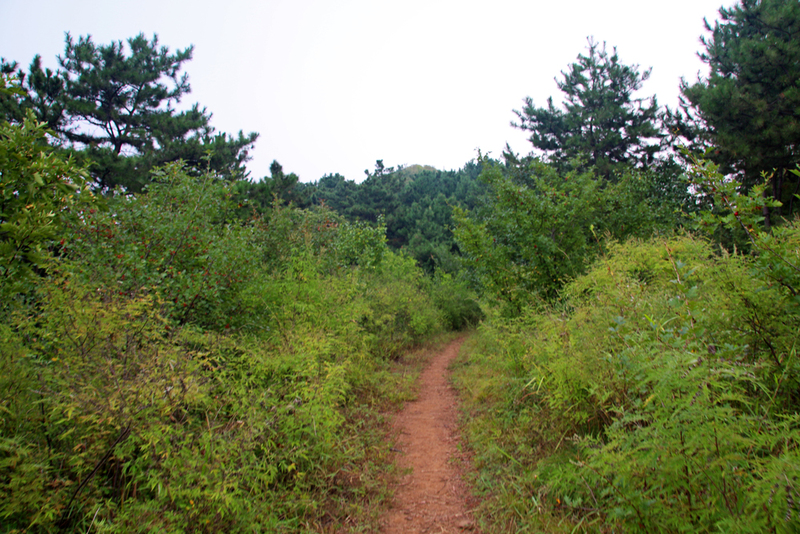 Would you like to explore an unrestored wild part of it like Gubeikou? 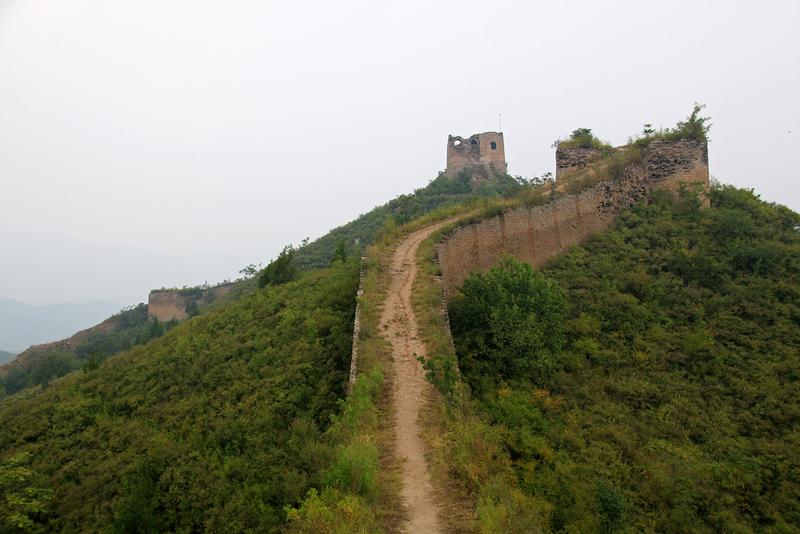 You can visit the Gubeikou Great Wall on a hiking tour or individually. The “Beijing Hikers” and “China Hiking” offer guided hiking trips which start and finish in Beijing. My friend works for the Beijing Hikers. 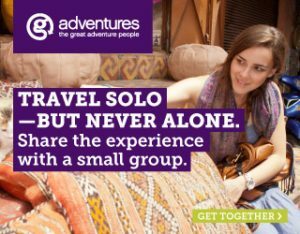 Their “Gubeikou Great Wall Loop” tour cost 450 RMB but club members of the “Beijing Hikers” get a discount of 10 percent. The club membership cost 200 RMB per year. Lunch is included in the tour price for all hikers, members and non-members. 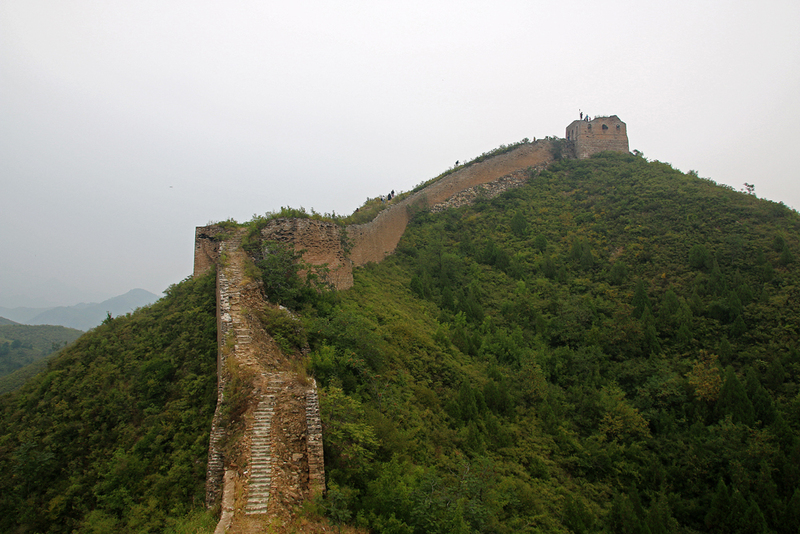 You can also go to the Gubeikou Great Wall individually by taking the express bus No. 980 from Dongzhimen station to Miyun station and from there with bus No. Mi 25. Tickets for both busses together cost 25 RMB. Furthermore you can hire a taxi for the day which can be booked through your hotel or hostel. Since I went on a guided hiking tour I don’t know how much a taxi would cost. Na, in Peking kenne ich mich inzwischen ja ganz gut aus, aber für die Chinesische Mauer, zumindest für die nicht-restaurierten Teilstücke, würde ich mir aber immer noch einen Guide nehmen, um zu vermeiden, dass man verloren geht. Bisher habe ich zwei völlig restaurierte Mauerabschnitte der Großen Mauer gesehen: vor vielen Jahren in Badaling und 2014 in Huangyaguan. Es war interessant, aber ich würde gerne auch den ursprünglichen, unrestaurien Mauer-Abschnitt von Gubeikou, von dem in Deinem Artikel so schöne Bilder zeigst, kennenlernen. Vielleicht gelingt es mir einmal. Vielen Dank für Deine netten Worte, Marie. Eine Wanderung auf einem nicht-restaurierten Teilstück der Großen Mauer kann ich Dir sehr empfehlen und ich drücke Dir die Daumen, dass Du bald einmal dorthin kommst. Thank you so much for the kind words, Agness. 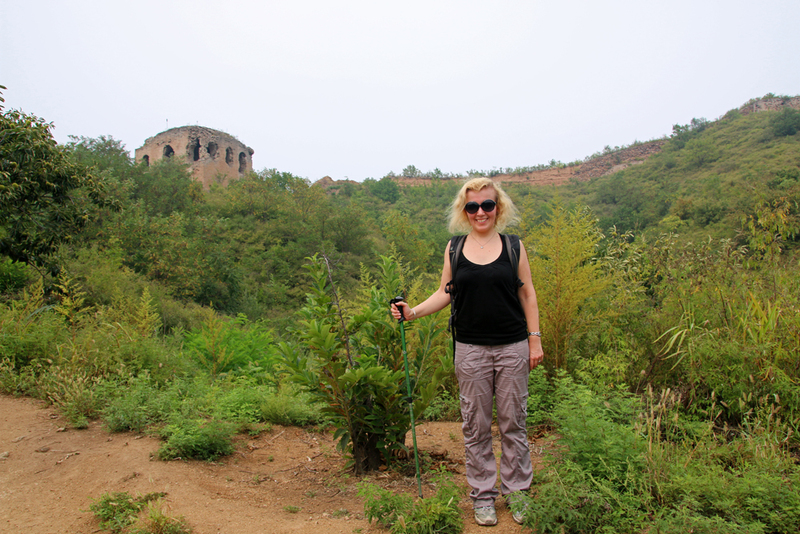 Hiking the Gubeikou Great Wall was definitely an adventure and an amazing experience. I highly recommend it. Hi Anna, you have probably seen photos from the Great Wall in Badaling which is the section most people and tour groups visit because it’s quite close to Beijing. While it must be a nice part I heard it’s often very crowded. It’s better in Mutianyu, another restored part of the Wall, at least on weekdays. And on the rough wild unrestored sections you often only meet a few people, if at all. Thank you so much for your comment and for stopping by. Wow, love these photos! 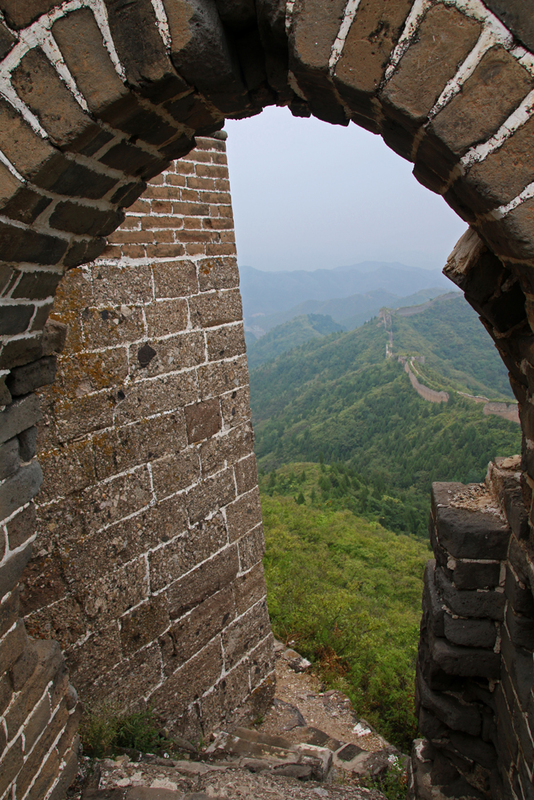 The Great Wall is definitely on my travel bucket list and now I”m more keen to get there soon! Love your blog. Thanks so much for the kind words, Sophie. 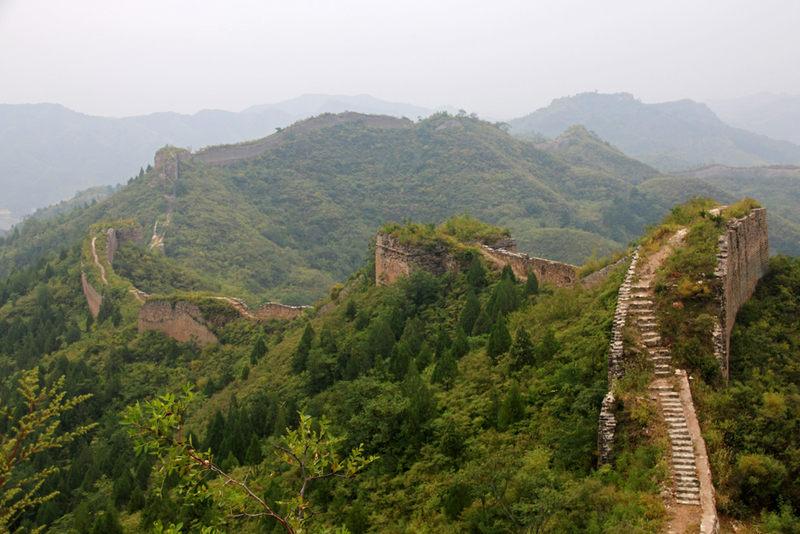 The Great Wall is definitely one of the places to visit once in your lifetime. While the well-preserved Mutianyu section is quite nice in the morning on weekdays, these unrestored, wild and lesser-known parts of the Great Wall are also very much worth to explore.